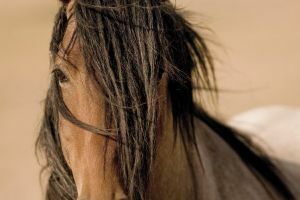 With a love of horses, Kimerlee Curyl captures in her photos the true essence of the wild stallions that roam the west. This beautiful horse has the untamed, free spirit that so typifies the magnificent creatures. With a wild, tangled mane that brushes across the horse's face, this animal thrives in the Freedom Wind. Ms. Curyl is an award-winning photographer who is active in the preservation of the wild horses of the west. She is passionately dedicated to her work with Return to Freedom - The American Wild Horse Sanctuary, whose goal is to save their place on this land. Says Curyl, "It's a magical place and I'm proud to be a part of it." The artist has donated several images to various organizations to help preserve the wild horses.